Letters are a written means of correspondence with another person, business entity or other organization. A letter can be comprised of an invoice, marketing message, personal note and any other item that fits into a business-sized envelope. The USPS provides a simple and affordable way to mail letters using First Class Mail. To qualify as a First Class Mail letter, your mailpiece must be no smaller than 3½” high x 5” long and at least 0.007” thick. It must be no bigger than 6 1/8" high x 11½” long and no more than ¼” thick. Letters sent via First Class Mail cannot weigh more than 3.5 ounces. high x 5” long and at least 0.007” thick. It must be no bigger than 6 1/8" high x 11½” long and no more than ¼” thick. Letters sent via First Class Mail cannot weigh more than 3.5 ounces. To mail a letter, you do not need to visit the Post Office as long as you have postage stamps, access to a postage meter or can print postage online from a company like Stamps.com. Simply address your envelope, affix postage to the upper right corner and drop it in a collection box or hand it to your mail carrier. First Class letters sent within the United States generally arrive within 1-3 days. First Class letters can be insured against loss and damage. You can also add services such as Certified Mail, Collect on Delivery or Certificate of Mailing. When you combine the ease of sending First Class letters with the convenience of Stamps.com, you and your staff will never have to waste time at the Post Office again! 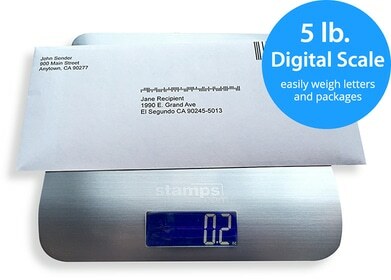 Not only does Stamps.com tell you exactly how much postage is required to send a letter of any weight, shape or size to any domestic or international destination, it also lets you print official, USPS-approved postage and address labels from the comfort of your own home or office. Access to all USPS mail classes. Skip the trips to the Post Office, print postage online 24/7. 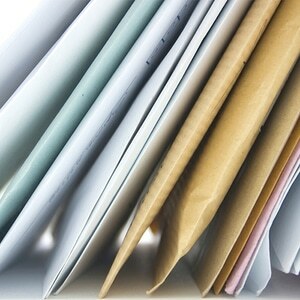 Print any denomination of postage on envelopes, labels or plain paper. Add USPS special services including USPS Tracking, Return Receipt, Registered Mail, Insurance and more.